Creat an Outdoor Haven Now and Save! 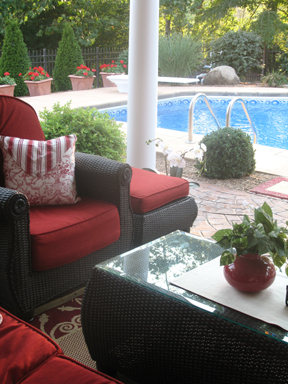 If you haven’t yet gotten around to creating an outdoor room this summer, it’s not too late! Most of us still have some sizzling days of summer left and fall evenings will be well spent gathering with family and friends around an outdoor firepit. Best of all, you can find some great bargains right now on outdoor furniture and accessories at your favorite stores. Here are some things to look for to add personality and warmth to a concrete patio or paved area. Indoor/outdoor area rugs – they can instantly tie an area together and add an element of warmth to an outdoor space. Mix and match furniture – remember, you don’t have to have a matched set for a fabulous look. Metal gates and wall hangings – these can be hung on a wall or even hung from the bottom of a balcony for interest or to define a space. Oversized planters, fountains, concrete sculptures, and decorative stones -these items will last for years, add an architectural touch and can pull an area together. Whimsical Items – allow you to have some fun and add surprises that will make this space your own. 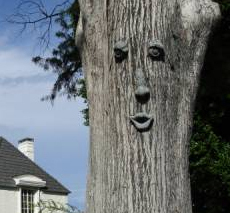 Hide an adorable frog or garden fairy in an unexpected place; put a “face” on your favorite old tree and accent with a spot lite at night – it’s a great way to start conversation. 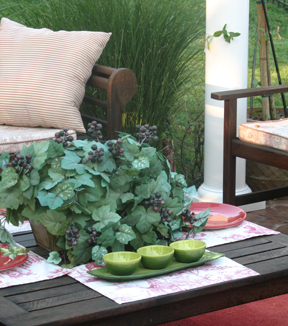 By creating an outdoor room you’ll have a great place to unwind and spend time with friends and family. I can’t think of a better way to enjoy the last days of summer and the beautiful evenings of fall!